The Rotary Club of Coronado proudly supports the Barrio Logan College Institute’s Education Program. 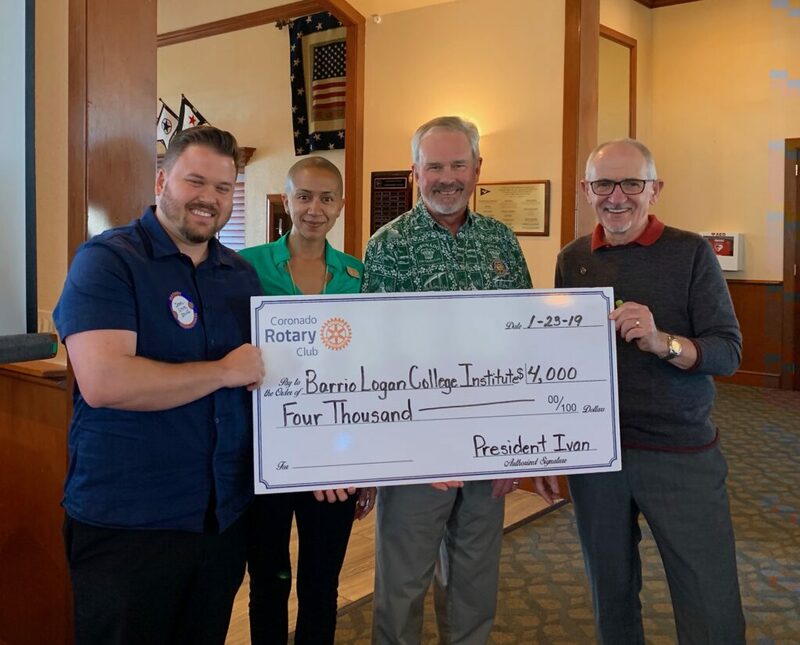 Coronado Rotary President Ivan Dunn (far right) presents Barrio Logan College Institute Executive Director Jose Cruz (left) with a $4,000 donation to support its nonprofit after-school education program. Also pictured are Dominique Davis, Rotary Committee Chair and Paul Laedlein, Rotary Community Service Director. The mission of the Barrio Logan College Institute (BLCI) is to break the cycle of poverty by preparing underserved students to be the first in their families to go to college through after-school programs that begin in third grade. Members of the Rotary Club have visited BLCI where they mentored students and learned more about the very successful after-school programs. The Rotary Club of Coronado Rotary presented the Barrio Logan College Institute with a $4,000 donation to support its education program. The Institute gives disadvantaged families the education, encouragement, and support they need to send their kids to college. Tutors, mentors, and speakers work hand-in-hand with students, families, and staff. All BLCI students are the first generation in their families to attend college and most are, or will be, the first to graduate from high school. Staff, students and parents form a supportive community whose goal is student success. 100% of BLCI high school graduates enroll in colleges and universities nationwide. To learn more about BLCI please visit www.blci.org. To learn more about Rotary and all we do, please visit coronadorotary.org.